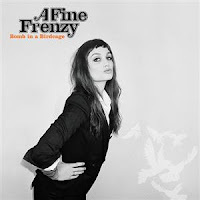 Quirky NY Chick: A Fine Frenzy's "Blow Away"
A Fine Frenzy have passed a million followers on Twitter and in celebration? of that, they're giving away a song. Hey, I'm all for any excuse to celebrate, especially when there's free stuff to be had. Visit their website HERE to get "Blow Away" which was recorded live at WKRQ in Cincinnati. "Blow Away" is the new single from their upcoming record A Bomb In A Bird Cage which is scheduled to drop on September 8.